Canaan, Vermont is centrally located and an ideal point to visit many attractions in Northern Vermont and New Hampshire and Southeastern Quebec. 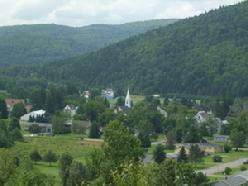 The Northeast Kingdom of Vermont is a scenic wonderland possessing bountiful natural beauty and resources. Its rivers, brooks and lakes are pristine, clear and provide ample recreational opportunities for boating, swimming and fishing. Mountains, forests, beaver ponds, and bogs provide refuge to numerous birds and waterfowl, moose, deer, bear, rabbits, squirrels, beaver, and other wildlife. These refuges provide local inhabitants and visitors to the area numerous hiking, recreation, and wildlife viewing opportunities. The myriad of activities (moose festival, soft ball tournaments, sugar on snow social, fall festival, art in the park exhibit, historical society parades, variety shows, dances, American Legion functions, snowmobiling, downhill and cross country skiing, snowshoeing, hunting and fishing, church suppers, etc) available meets the recreational needs of everyone.